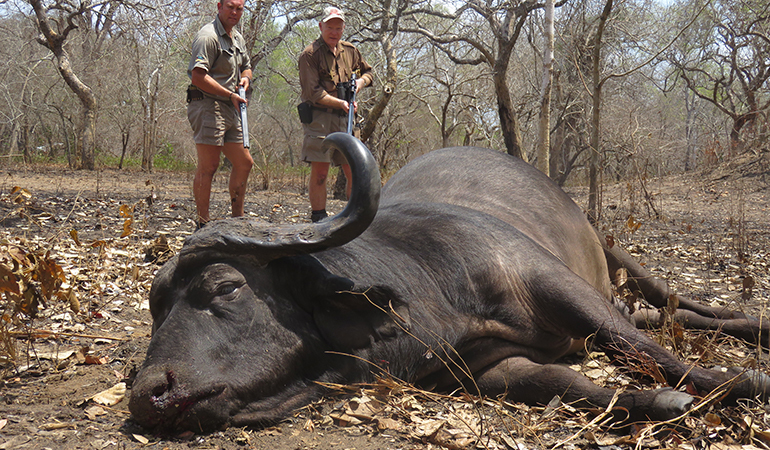 This buffalo is down…but this is the moment when trouble sometimes starts. PH Ben Rautenbach and Boddington are approaching the proper way, from the rear with rifles fully ready! The operative part of “dangerous game” is danger. Hazard is not constant and, in fact, only rarely comes into play. Bad things usually happen when mistakes are made, such as not shooting straight in the first place. Like so much hunting, and entire careers spent in law enforcement and military, hours and days of boredom may be interspersed with a few seconds of sheer terror. You can classify “dangerous game” as you wish. Africa’s Big Five is in there, likewise our big bears and other big bovines. I’m on the fence on wild boars, but I’ve had close calls and I know people who have taken tusks – for sure the pig was dangerous at that moment! However, it’s not so much about the animal as the hunter. I have zero patience with adrenaline junkies who take unnecessary chances. Yep, we’ve all seen the videos. Fear is a natural thing. If you aren’t at least a little bit scared when you’re working in close with a large animal that can easily gore, stomp, bite, claw, toss, or eat you there is something seriously wrong. You need help. Unfortunately, because the Lord looks after fools, you may get away with idiocy now and again, and often somebody far less deserving will get hurt. In the last few years, I’ve had two friends killed by elephants and another by a buffalo. The sad thing is that all three of these guys were experienced, competent hunters who consistently used proper caution and good judgment. This falls under the heading of “bad things happen to good people.” Unfortunately, this doesn’t seem to happen often to reckless showboats who go around asking for it. Life isn’t always fair, and neither is death. The hunters I respect go in calmly, thinking their way through the situation. If they show fear they keep it to themselves. However, unlike you and me, professional guides typically have enhanced knowledge of exactly what lies ahead, and how bad it can be. Recently, I was in Mozambique with Franz Koupe, now in his early 80s, still hunting. Franz is a legend, one of very few professional hunters to complete 50 full seasons. I asked him how many buffalo charges he had seen. “Oh, 40 or 50!” Geez! No one was ever hurt! One can assume correctly that he knows his business, exercises caution and has enjoyed a modicum of luck. Remembering that bad things happen to very good people, not all charges can be stopped. And a buffalo is one thing. No one will stand 40 or 50 leopard charges without people getting hurt. 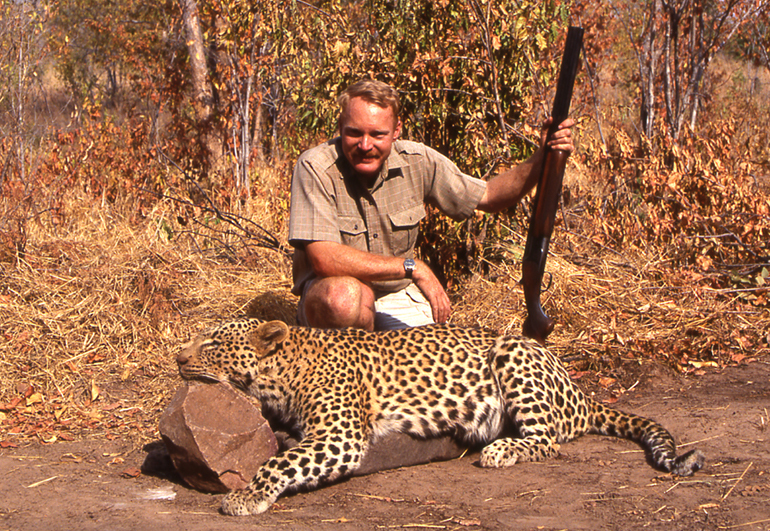 Boddington’s closest call with an animal came from this leopard inZimbabwe in 1992. After a long follow-up buckshot failed to stop the charge;fast shooting by PH Russ Broom with his double .500 saved the day. For a recent book on the subject, I interviewed an American gent who was badly gored by a wounded buffalo, the worst injury in the same leg that had taken a bad bullet wound in Vietnam. That he didn’t bleed to death was a miracle, but the strangest thing about his story is that his PH ran away, never to be seen again. This is not supposed to happen, but we amateurs tend to assume that our PH will pull our fat out of the fire. Maybe, but in today’s Africa, regrettably, there are quite a few licensed PHs with limited experience on dangerous game, some of whom have taken a two-week course, just as you or I could, and been anointed. Countries vary; Zimbabwe has Africa’s most rigorous PH licensing system, followed by Namibia. When planning a hunt for dangerous game, it’s perfectly okay to ask the hard questions and determine the level of experience of the PH who may hold your life in his hands. On the other hand, the reverse is also true. It is impossible to orchestrate exactly how a dangerous encounter might play out so your PH may need to count on you to bail his fat out of the fire. This happens, and the amateur hunter that pulls it off passes into campfire legend. Don’t count on it, and also don’t think that you will know what to do…or what you are actually going to do when the stuff hits the fan. In the military we rely on training kicking in. History has proven that some soldiers readily fall back on their training and others do not. You cannot anticipate your reaction when in the midst of a charge by a dangerous animal or under fire for the first time. Perhaps the bravest act I know of in the hunting world took place when “Zim” PH Cliff Walker and his client wounded a “problem lion” late one afternoon on a sugar cane plantation in Ethiopia. The smart bet was to wait until morning, but there were people around, and somebody could get munched. So, they went in, back to back, Cliff and his hunter, in bad light, one row at a time – a nightmare scenario! They got the lion, but both were badly mauled. In today’s society, few of us have military training and experience. But in preparation for a dangerous game hunt, we can train. Practice as much as possible until the handling of your chosen arm is fast and natural and you have confidence. Close-range drills are essential: Turn to the target, raise the rifle, and shoot. In a charge the shot will be offhand, unsupported, and there is no time to mess around. Put yourself in the place of your PH. He is going into thick stuff after a dangerous animal that could kill anyone in the party. The animal is a concern, but an equal worry is a person with limited experience wielding a firearm. I can instantly rattle off several incidents where a PH or tracker was shot during the wild melee of a charge. 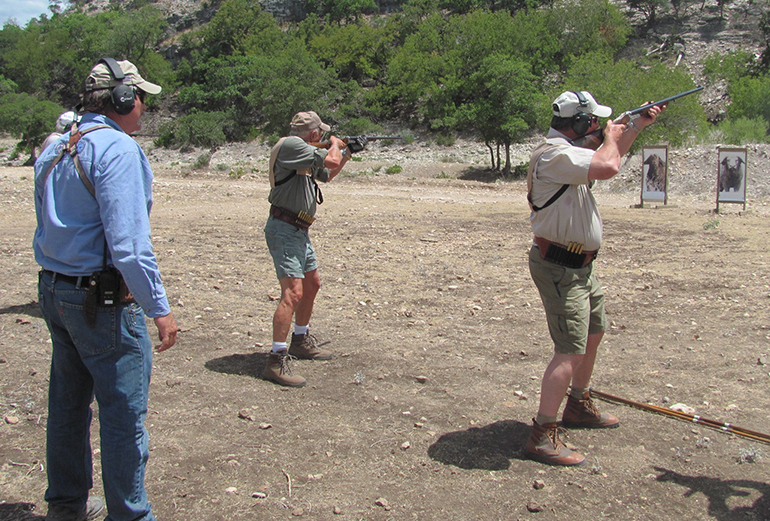 At the SAAM Safari Course shooters are practicing “turn and shoot”drills, using life-size buffalo targets. This is excellent training both forclose-range encounters and for achieving familiarity with and confidence in thedangerous game rifle. Exactly how a dangerous follow-up is conducted must be the PH’s call. A few prefer to go in alone, or call for experienced help if any is available. Based on assessment of your experience and shooting skills you may or may not be invited. If you are, let your PH direct operations, and do as you’re told. And, please, don’t tell me how you might react. It’s impossible to know. Most important, pay attention. Some animals typically telegraph their intent with grunts, growls, or thrashing tails, but don’t count on it. A charge can come silently, with no warning and from any direction. All you can do is stay ready, rifle at port arms, muzzle in a safe direction, safety engaged until you raise your rifle to fire. Being completely ready every second is impossible, but you must stay focused. Accept that some charges cannot be stopped, so their consequences must also be accepted. Finally keep in mind that a bullet is generally more dangerous than the animal. So, part of paying attention is making sure you know exactly where every member of the party is at all times. I just saw a brief video clip of a recent leopard charge stopped at very close range. I have no idea how the tracker avoided the bullet. The only cure is situational awareness and, no matter how desperate the circumstances and how hard the grip of panic, you can’t shoot unless you’re sure.